Successfully Added Intelligent Home Security System - 3x Motion Detection, 3x Door Sensor, Smoke Detector, 2x Remote Control, SOS Feature to your Shopping Cart. This intelligent home security system will help you to protect your property from all sorts of danger and unwanted guests at all times. Coming with an abundance of security sensors, you can be guaranteed that you and your loved ones will always be in safe hands. Although coming with 7 sensors, the security kit can be extended by adding numerous of other sensors as it is capable of supporting 160 detectors in 5 different zones at once. 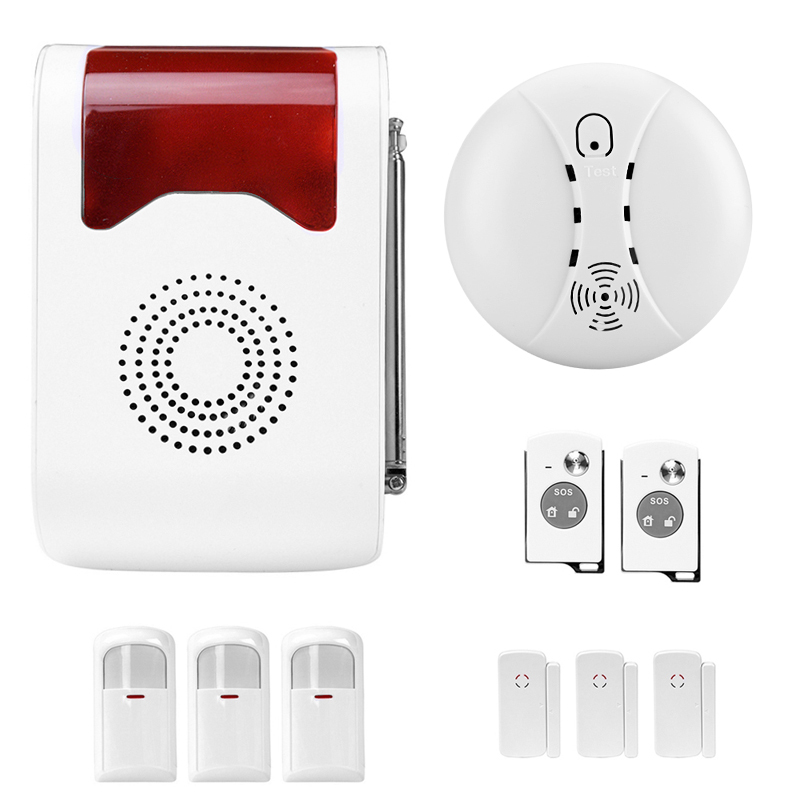 No matter the size of your house, office, or factory – this high-end alarm kit is guaranteed to deliver top notch protection 24/7. Coming with three door and window sensors, this intelligent home security system allows you to secure all the main entrances to your property. From now on nobody will be able to enter your house or office space without being noticed as these highly sensitive sensors will send out an alarm whenever movement in your door or window has been detected. Additionally, this alarm set also features three motion detection PIR sensors – allowing you to take your property security to the next level. Simply attach these indoor PIR sensors near any entrance or important area of your property and an alarm will sound whenever motion is detected in the guarded area – assuring that you and your surroundings will always be informed when an unwanted visitor has entered your house or office. Not all dangers come from unwanted visitors. This is why this high-quality security system also features a state of the art smoke detector that detects smoke up to a distance of 20 meters away. Sending out a loud alarm when smoke is detected, you can be assured that with this trustworthy sensor at your side, you’ll never be surprised by an out breaking fire. All sensors can be easily controlled, activated, and deactivated through the included alarm host. Additionally, this smart home surveillance system also features two compact and portable remote controllers that can be efficiently attached to your key ring. These handy remote controllers allow you to activate and deactivate the alarm system while, additionally, they give you the option to instantly sound the alarm with the press of a button in case of emergency. This intelligent home security system comes with a 12 months warranty, brought to you by the leader in electronic devices as well as wholesale electronic gadgets..
Arabic: - نظام أمن الوطن - Chinese Simplified: - 家庭安全系统 - Czech: - Domácí bezpečnostní systém - Danish: - Home Security System - Dutch: - Home Security System - French: - Système de sécurité résidentiel - German: - Home Security System - Hebrew: - מערכת אבטחה? - Hindi: - गृह सुरक्षा प्रणाली - Italian: - Sistema di sicurezza domestica - Japanese: - ホーム セキュリティ システム - Korean: - 홈 보안 시스템 - Malay: - Sistem keselamatan rumah - Norwegian Bokmål: - Hjem sikkerhetssystem - Romanian: - Sistem de securitate acasă - Russian: - Домашняя система безопасности - Spanish: - Sistema de seguridad para el hogar - Thai: - ระบบรักษาความปลอดภัยบ้าน - Turkish: - Ev güvenlik sistemi - Vietnamese: - Hệ thống an ninh gia đình.